Last week, the FAI appeared before the committee. SHANE ROSS AND Sport Ireland are to appear before an Oireachtas committee today to discuss the FAI. They will meet with the Joint Committee on Transport, Tourism and Sport at 12 noon in Committee Room 4, Leinster House to “discuss matters related to the FAI”. Last Wednesday the FAI came before the Committee, and tomorrow, for the third time in less than three weeks Governance will again be a central theme as Sport Ireland return to the Oireachtas. John Delaney’s appearance at last week’s committee meeting was much anticipated, as it was expected that he was to be asked about a €100k bridging loan he provided to the FAI. However, Delaney said on the day that due to legal advice, he wasn’t able to answer any questions on this. Some TDs were unhappy about his performance at the committee, with Ruth Coppinger calling on the FAI board to step down in its wake. The Taoiseach Leo Varadkar said on Friday that he didn’t think “anybody would be satisfied” by Delaney’s Oireachtas appearance. The FAI responded to eight separate questions at the meeting by saying they would return with an answer afterward, but no responses had been sent to the politicians who posed the questions or the office of Committee Chair Fergus O’Dowd as of 4.30pm on Friday afternoon. Over the weekend, The42.ie reported that John Delaney was set to leave the FAI. His future was discussed at board meetings over the weekend. There were more reports in the Sunday Times about Delaney, focusing on alleged credit card spending. At today’s meeting, representatives from Sport Ireland will face questioning from the committee. 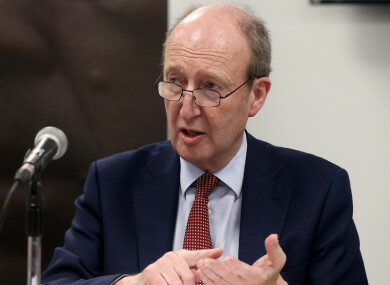 The Minister for Transport, Tourism and Sport, Shane Ross TD will also appear as a witness. Last week, Sport Ireland said it had decided to suspend and withhold future funding to the FAI. The Committee has scheduled a meeting with Sport Ireland for the second time in three weeks, and following on from the appearance of the FAI, we hope Sport Ireland will be in a position to update us further. The discussion two weeks ago was very insightful, and we expect they will be able to provide answers to the questions which, they did not have information on, at our last meeting. Similarly, the input of Minister Ross is an opportunity we very much look forward to. Deputy O’Dowd said that the Committee “is determined to build on our work as we explore governance, and issues which have come to light in relation to the FAI”. Committee proceedings can be viewed live on the Oireachtas website, or through the Houses of the Oireachtas Smartphone App. Email “Shane Ross and Sport Ireland to appear before committee over FAI today”. Feedback on “Shane Ross and Sport Ireland to appear before committee over FAI today”.